The Citroen C4 Picasso was voted the Continental Irish Car of the Year 2014. Pictured are Frederic Soulier, managing director, Citroen Motors Ireland with model Adrienne Murphy. The Citroen C4 Picasso received 377 votes from the Irish Motoring Writers Association (IMWA ) jurors, just ahead of the Volkswagen Golf (364 votes ) and the Mazda6 (327 votes ). 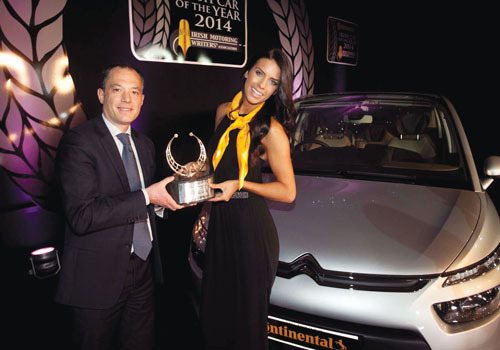 It is the third time that Citroen has taken the overall Continental Irish Car of the Year title. Members of the IMWA awarded their votes on the basis of key criteria including safety, equipment level, fuel economy, comfort, innovation, practicality, ride and road-holding. In total, a field of 51 cars contested the very competitive Continental Irish Car of the Year 2014 awards. And last year the Continental Irish Car of the Year title went to the BMW 3 Series.